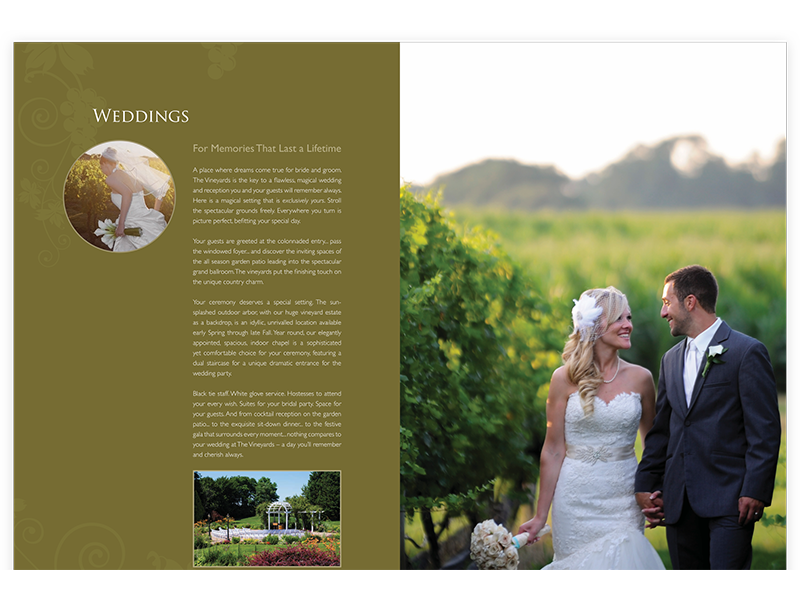 Linx was retained to create a new look and feel for The Vineyard Caterer's wedding marketing program. We researched the marketplace to measure the expectations of couples in a wedding facility, who was making the decisions, what other competitors were being considered and what drove the final decision. The Vineyards only held one event at a time, featured world class cuisine and boasted a beautiful manicured working vineyard as the setting for a wonderful country manor that could hold events for 200+ guests. This splendid combination needed to be featured in promotionals that would display its uniqueness and beauty. Linx recommended up-ticking the venue’s identity by dropping the word "catering" and changing it simply to "The Vineyards". Linx also developed an oversized brochure that featured large photography to display the beauty and high quality found there. 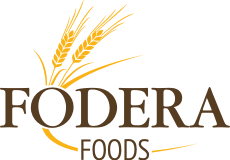 These elements were repurposed for a new website that has been the single-most successful marketing tactic in the history of the company. As part of our ongoing SEM & PPC program to generate leads for The Vineyards, Linx moved some of the online media budget from Google Adwords to Facebook for more extensive targeting, resulting in increased conversions. 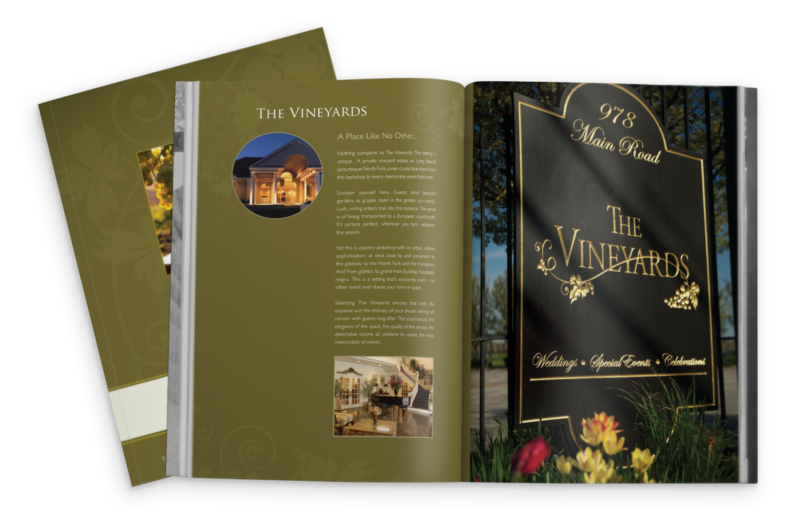 Linx created an elegant brochure for potential customers of the The Vineyards to browse details about venue and the offerings. 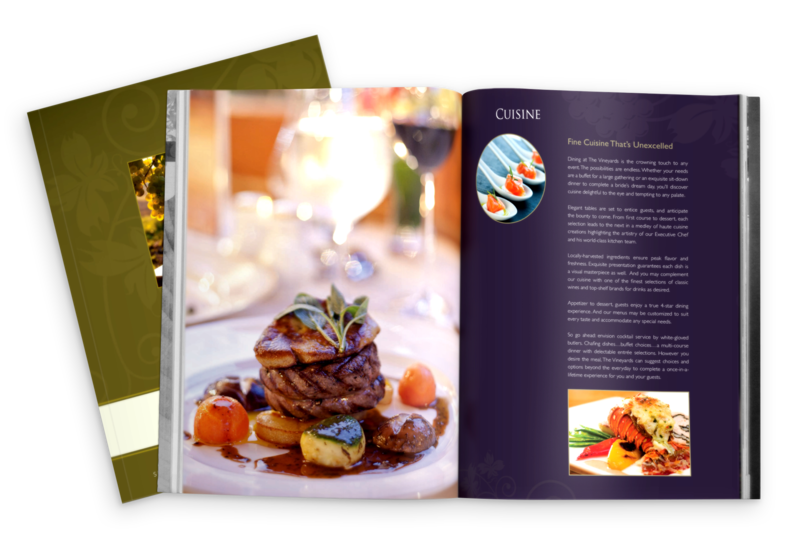 We designed each page with large, stylized imagery and crafted the copy to depict the ambiance of the venue. The wedding photography used in the brochure was provided by real life brides and grooms who hosted their wedding at The Vineyards in order to stay true to the grounds and facility, as well as show the emotion radiating from the couples. The Vineyards has seen a doubling of leads generated and is almost completely booked for weekends for the next two years. Closing rates have climbed from 33% to 38%, which means that our media budget shifts and new advertising channel predictions were right on target.